From the start, Kevin has been a hard sell as far as human companionship is concerned. Once he was introduced to Toby and Kelly we humans hung back for a bit. 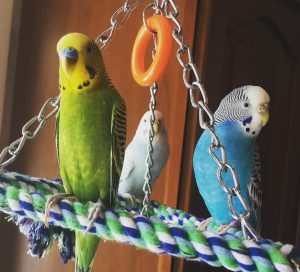 It seemed more important that he get along well with the budgies and find his sweet spot in the bird flock, so taming our male budgie was put on the back burner. 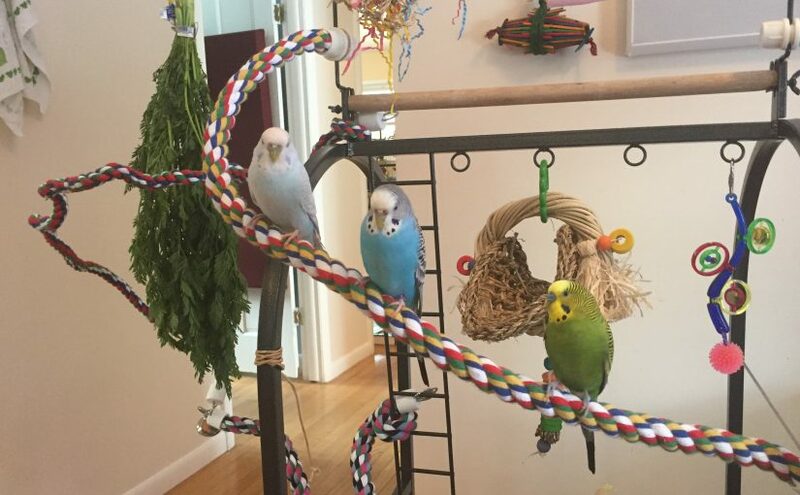 Kevin has done so well fitting in with our girl budgies. It took some time for them to stop trying to bite his head, but now he’s got this great vibe going. I’m not sure how he negotiated it, but they both seem to respect him without requiring much violence at all. It’s rare to see him fight with anyone, but he somehow manages to get his way. And he’s so happy most of the time! He sings all day and tries to feeds the girls, even though they are not having it. He has intense conversations with inanimate objects, sings along to the radio and tv (his favorite show is Intervention ), loves taking baths and trying new foods. Now that he’s been through a big molt he has almost all his flight feathers back and he is definitely the fastest flyer of all three. Sometimes he even has to take extra loops to slow down before landing. 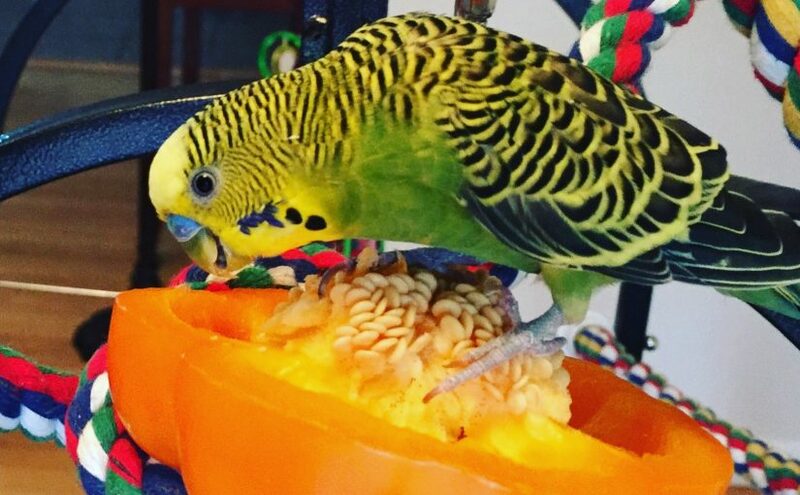 Kevin is basically the perfect pet parakeet, except he thinks that his human family is not to be trusted! Patrick tried working with Kevin pretty intensely when he was in quarantine to no avail. I had hoped that once Kevin saw that Toby and Kelly basically treat me like a human play gym he would loosen up a little bit. And he has, but it is taking months. Kevin will step up when asked, and then tends to look for his first chance to escape. 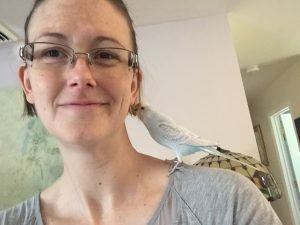 We’ll go on for weeks of me asking him to step up a few times a day and then all of a sudden he’ll land on my shoulder, or randomly decide to beak my nose or glasses. I, of course, get excited thinking we’ve made a break through, and then he goes back to alternately ignoring me or acting like I’m very suspicious! Don’t get me wrong, I’m thrilled he’s happy, and I’m sure I should be even more thrilled to have such a polite and shy young man, as a counter point to my crazy, brash girls. But, I do look forward to building a bond with Kevin and showing him how cool his human flock can be. I’m grateful that these little guys have a nice long life span; I should have a lot of years to make friends. Lately I’ve been working with him much more and using my old standby Millet . It’s a bit square one as far as taming goes, but hey, whatever works! I hope that continuing to have him associate me with the possibility of treats will eventually unlock a bit more trust. I am constantly counseling patience when budgie owners express frustration with their standoffish birds. It’s hard to take my own advice, but I’m confident that if I keep on the steady treat-giving path we’ll get there! How do you not want to be friends with this guy? 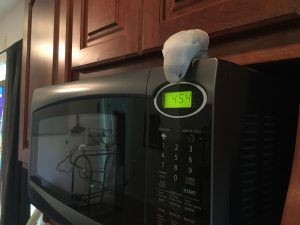 Pet owners who have cared for small pets in the rodent or reptile family may wonder what budgies should smell like, considering other small pets can have such a strong odor. Budgies are a totally different ball game, not only do they have a particularly lackluster sense of smell, but they don’t produce odor themselves. Under good conditions, what budgies smell like is nothing, what they rub their heads on, or what they eat. 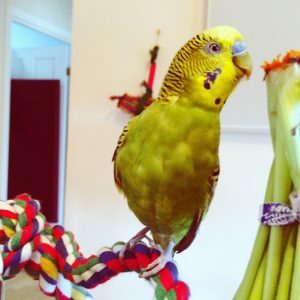 This extends to their poop as well, if your budgie’s poop is smelly then he may be ill and you should seek veterinary care. Literally, you should be able to not clean your cage(s) for weeks (totally not recommended) and it should not smell. 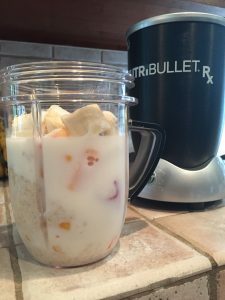 If it does smell and you have been feeding fruits and vegetables look to see if you’ve missed some scraps of food that are rotting. Also, watch out for ants! 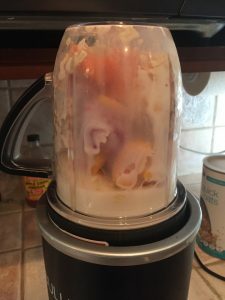 Typically, I find that my parakeets smell like very mild citrus, which is pleasant and comes from their seed mix . For a while I was freaked out because Toby smelled like tomato soup, at the time I was trying her on Roudybush Pellets and it turns out those smell like tomato soup to me. 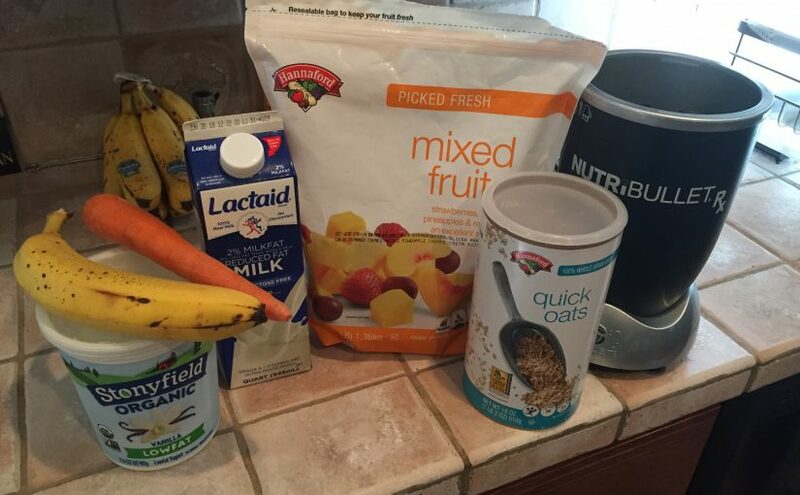 Another cause of transient smell can be eating fresh vegetables and fruits. After Kelly eats broccoli she has very distinct and fairly gross broccoli breath. That makes sense because the broccoli is hanging out in her crop for a while with her hulled seeds, basically composting itself. If that smell persisted it would be another sign of illness such as a crop infection, impaction, or sour crop. Persistent bad breath can be a sign of other internal issues as well. 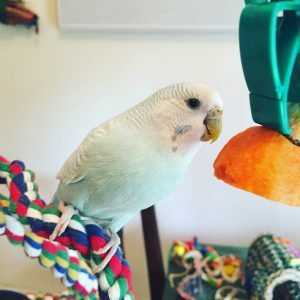 If your budgie has a foul odor coming out of its mouth that can’t be tied to eating something and lingers beyond a day then it is probably time to find an avian vet and get a diagnosis and treatment. For anyone who’s been wary of getting a budgie due to the potential of bad odors, fear not! Their lack of smell is part of what makes a budgie an excellent pet for a smaller space/apartment, in my opinion. 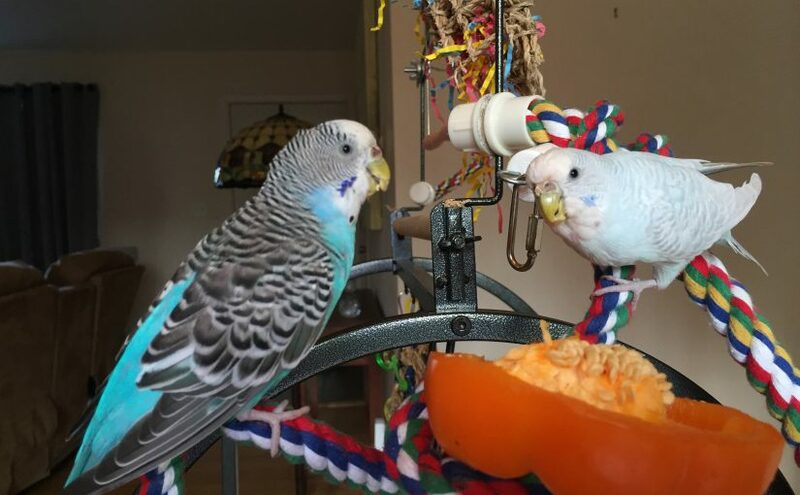 And for those of us who are already budgie owners, keep your nose at semi-alert, a new odor on or around your budgie can be an excellent first warning of illness or habitat conditions like rotting food that need to be remedied. Disclaimer: As always, I’m not a vet and I’m not qualified to diagnose or provide recommendations for medical treatment of your pets. When in doubt, seek the expertise of an avian vet. 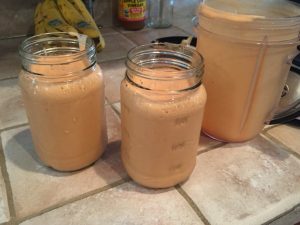 So, you brought home your first pet bird, and if you’re anything like me, you immediately started hitting Google and other resources with all sorts of questions. Things like, how long should my bird sleep, what’s the best food, etc. As you do more research, another question starts to loom large: what the heck is this animal called in the first place? Did I get a parakeet, a fancy parakeet, a budgie, or a budgerigar? You have a budgie which is the common term for a budgerigar, a small Australian parakeet. A parakeet is a parrot with a long tail and a slender body. There are hundreds of types of parakeets and budgies are just one of them. So, look at you go, in one new friend you have a budgie, a parakeet AND a parrot! Then they asked themselves if there was any other name they could call it and realized that it’s also a parakeet. Patting themselves on the back, they decided that budgies would be known as parakeets, and any other parakeet would have to pick another name or a modifier! This is how we came to have our little misnomered babies. 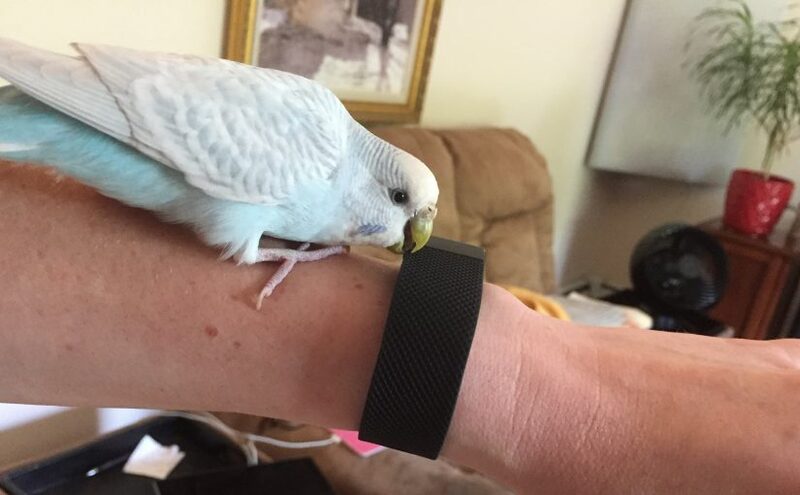 Here at Home Keet Home, I end up using the terms somewhat interchangeably, which is less than ideal if I want to look like a well-informed budgie owner! 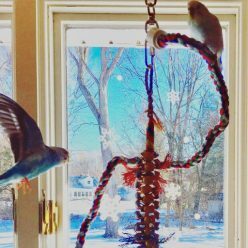 But, keeping in mind that many readers will be A. American and B. new to budgie parenthood, it seems prudent that folks be able to find us no matter where they are in the world or where they are in their journey with budgies! You may also hear the term “English Budgie”. There really is no such thing as an English budgie. 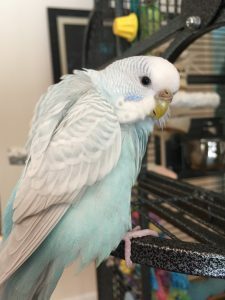 What people are talking about are larger Show or Exhibition Budgies that have been bred with some different characteristics, frequently for the purpose of showing them in the way that people who breed championship dogs would, although there are many people who breed exhibition style budgies for pets only. Ultimately I don’t think anyone should feel shame or be shamed for using the terms they are familiar with. 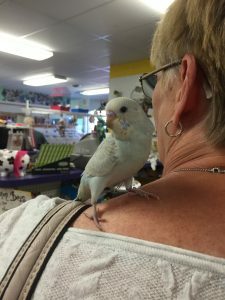 Much like learning over time about the complex social, emotional, intellectual and physical needs that budgies have, I wouldn’t expect anyone to know day one that the animal that was called a parakeet in every pet store in the USA is more accurately a budgie!